Lighting Provision Made inside the Temple. Top: At the top, a dome is placed with fine designs and carving. In front and sides of the dome lies Mehraab with ethnic style floral carving with designer shikhar. 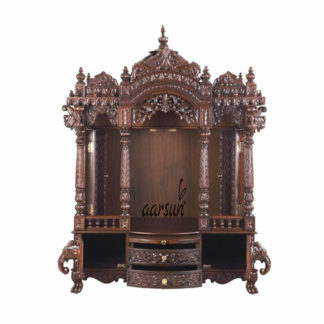 Base: The base contains 2 drawers for pooja essentials. 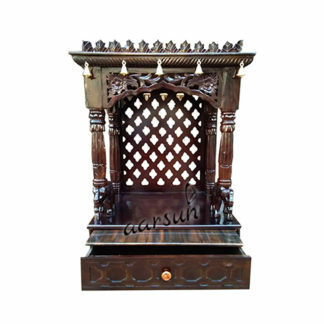 Slider pull out tray is provided for placing Dhoop / Diya adjacent to which are two Cabinets with Beautiful Elephant Heads carved in front. The whole Temple is supported by 4 legs. The unit is in antique dark walnut matte finish. The unit is a fixed Temple.